From the 2016 Great March of Return. This text is adapted from a talk given at a panel discussion, Permission to Speak: Boycott and the Politics of Solidarity, that took place at Brown University in early March — convened for the launch of Assuming Boycott: Resistance, Agency, and Cultural Production (OR Books), edited by Kareem Estefan, Carin Kuoni, and Laura Raicovich. 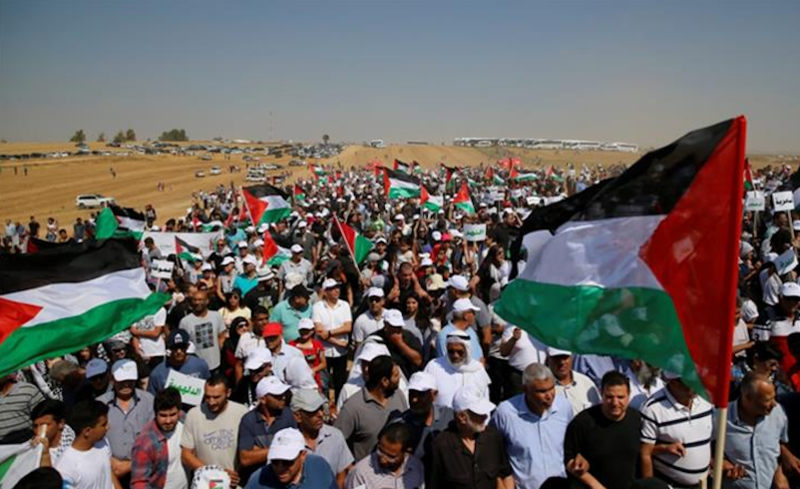 With the growing power of the BDS movement, and the approach of the Great March of Return, scheduled for March 30, it worth restating the obvious: Palestine was declared nonexistent at the moment the state of Israel was declared existent. Rather than repeating what BDS is about or what motivates Palestinians’ just attempts to live in their homeland, I’ll rather dwell on what they have to struggle against — a structural colonial amnesia. Colonial amnesia produces new realities and generates a repertoire of speaking positions for colonial citizens who are recognizable as legitimate speakers in a world shaped by colonialism. They are differentiated from those assigned to people who are forced to become colonized subjects. International law, in turn, is shaped in order to submerge imperial and colonial crimes in a state of visible amnesia and to make its actors unaccountable. Colonial amnesia is not a state but rather a technology that operates through citizens. To be born an Israeli citizen after 1948, means to be engineered as a device suitable for the maintenance of the colonial amnesia which aims to render Palestine on the one hand nonexistent, and on the other a threat. This can be illustrated by the way that the attempts of Palestinians who were expelled from Palestine and their descendants to return to their home(land) are blocked and met with violence. 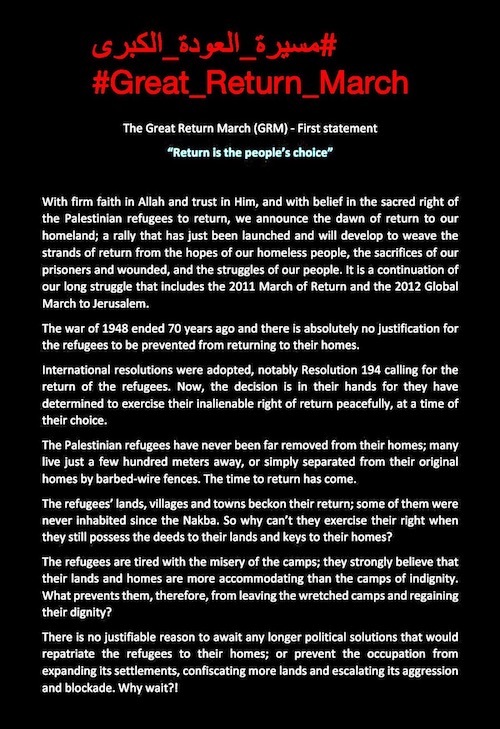 Call for the upcoming Great March of Return. Colonial amnesia is more likely to succeed when that which is to be erased from memory is also physically destroyed; however, since the destruction of Palestine was never completed, its erasure from memory could not be completed either. Well orchestrated as colonial amnesia is, it never succeeded in making Palestine completely nonexistent. Colonial amnesia did succeed in making this nonexistence as real, factual and objective as its existence, as if the deformation of Palestine was equivalent to its erasure. Palestine was the place to which many people, who were not yet primarily defined by their ethnic, racial, or national markers, belonged (Robert Young), before it became nonexistent and its Arab inhabitants — the only ones who are today called Palestinians — were alienated from it. The colonial state erased Palestine through the imposition of an imperial taxonomy predicated on an “absolute difference” (Edward Said) between Jews and Arabs. Though the difference was generated by the particular colonial amnesia of 1948, it actually has precedents, reiterating previous similar operations, such as the Crémieux decree of 1870 that granted the Jews in Algeria with French citizenship. This differential citizenship stood over and against the status of the Muslims with whom they shared a world, and from whom they were interpellated hereafter to dissociate themselves. Such absolute difference is one of the major tools of the colonial state. It guarantees (a) that people who share a world will not share the same perceptual organs to respond to the disaster generated by the regime under which they are governed, and (b) that the regime’s modalities of violence will be internationally approved as means of rule and governance. Thus, the destruction of Palestine as a place shared by many became the ontological basis for making acceptable the continued destruction of the world (in the Arendtian sense) called Palestine. From that moment on, this world became associated with one group who was condemned to live on the verge of worldlessness, i.e., outside and bereft of this world declared nonexistent and bereft of a solid world in general, as is made clear by the recurrent campaign of destruction that targets Palestinian attempts to build and maintain a world. Being born an Israeli citizen means abiding by a contract that commands that the existence of Palestine is to be denied and admitted at most as a “side” in a conflict. BDS is not only about permission to speak — it is about the colonial ontology of the world. The double declaration — Palestine nonexistent, Israel extant — issued by the colonial state rendered the visible colonial crime unrecognizable as such and shapes it as “a conflict” between two sides with no history of its making. As part of a cohesive “side” vis-à-vis a cohesive “Palestinian side,” Israeli citizens of Jewish origin facilitate the erasure of the colonial crime of making Palestine nonexistent and the constant sanctioning Palestinians for their mere existence. After all, they are the ultimate ontological proof that Palestine did exist and still exist if the imperial taxonomy predicated on the absolute differences that organize all the others is rejected. The BDS movement is not just means to an end; the BDS movement in itself is the renewal of politics as the condition of plurality, the necessary condition for a repaired world after the catastrophe of the destruction of Palestine. The fact that only a few Jews-made-Israelis participate in the BDS movement doesn’t change the condition of plurality proposed by BDS. This condition is based on the premise that Palestine should be recovered as a place in which Palestinians can be at home again, reparations must be envisaged for a just world to be made out of the ruins created by the state of Israel. BDS, though, is a call not only to stop the occupation and alleviate the suffering of Palestinians under it, but also to recognize the constitutive violence inherent to the colonial state. 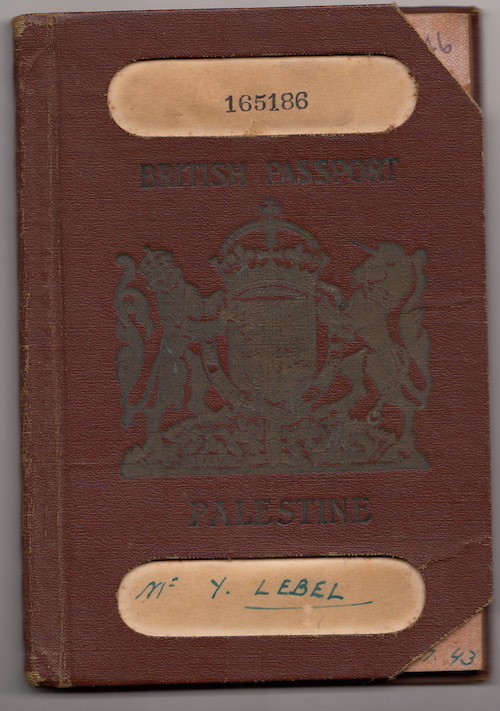 The existence of the colonial state requires that the majority of the inhabitants of Palestine who lived there before it was declared nonexistent are excluded from the body politic recognized by the colonial state, and that the amnesia through which the world sees Palestine-made-Israel will continue to exist through Israeli citizens, the state’s ultimate pieces of evidence. Confining Palestinians to an outside (“absolute difference”) enables the existence of an “Israeli side,” an ontological proof of the fact that Palestine is nonexistent. By calling for the return of refugees, BDS is also an intervention in the past, in what was made past, a rejection of the description of this past as irreversible and over. Responding to the call of BDS is an opportunity for Jews-made-Israelis to escape from the curse of colonial amnesia and recover the memory that will allow them to transcend the position of perpetrators — and allow them to participate in the elaboration of a renewed civil contract with those who act as the anti-colonial guardians of a world that colonialism seeks to fully destroy. By assessing the premises of BDS’ historical narrative, by renouncing the speaking position defined as “Israeli,” colonial amnesia is forfeited. The awakening of the memory of Jews-made-Israelis in response to BDS, and their acknowledgement that Palestine is part of them, is necessary in order to end the colonization of Palestine differently than other cases, such as the end of the colonization of Algeria. Under the condition of colonial amnesia, such affirmation can be made not with archival documents qua proofs, but rather through ontological assessments of Palestinian claims. 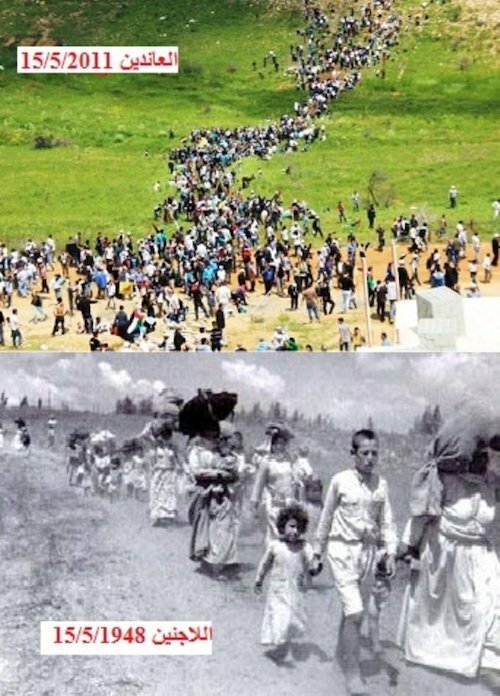 Namely the claim — and lived experience — that Jews-made-Israelis, a second generation of perpetrators, were given the role of keeping Palestinians at an absolute distance from a position from which they could claim the reversal of their plight and put forward claims that concord with their ontological existence, that is, as Palestinians, the people of Palestine, and not intruders to the Zionist state. The BDS movement is an attempt to counter the Zionist narrative of Palestine, and this is why it is responded to with battalions of constructors of truth, soldiers in the “hasbara” army, who are toiling to make sure that the narrative implied in BDS is understood as the Palestinian version of the story, and not a narrative that can be shared by others across the absolute differences provided by the colonial state. BDS is one more gift offered to Jews-made-Israelis, an invitation to part ways with the position of perpetrator and contest the authority of the state to engineer their mind, memory, imagination and modes of life, define their existence as agents of its violence and deprive both them and Palestinians of the possibility of ending the colonial project, paying for it, and repairing the shared world.